Perfect off duty style! 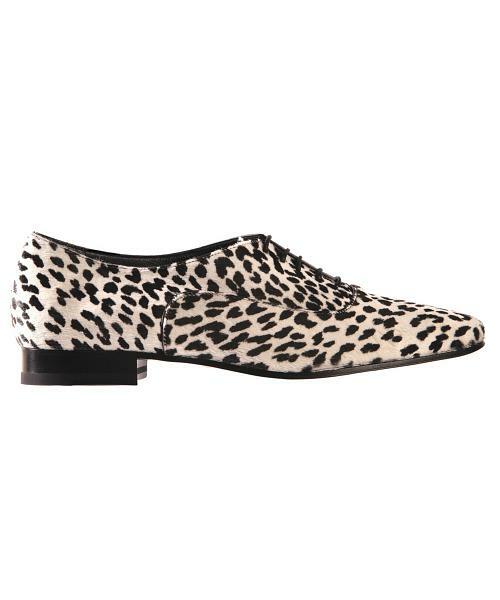 The Saint Laurent Oxfords feature a bold babycat pony hair print with a delicate tapered toe. In 2004 the company is in the red and the Haute Couture line of Yves Saint Laurent is ceased. With the death of Yves Saint Laurent in 2008 the former fashion empire falls into a deep depression. In 2012, finally, Hedi Slimane brings in a new, fresh spirit to the house YSL as the follower of Stefano Pilati. Up to that point the fashion line is known under the name Saint Laurent Rive Gauche, which Slimane deliberately changes. The recognizable “Cassandre”-logo with the initials YSL, however, remains the distinctive feature of the label and is used particularly as embellishment on Saint Laurent bags. The new logo of Saint Laurent Paris is deliberately designed in the same font in order to clearly communicate the origin of the label. As a son of a Tunisian and an Italian Hedi grows up in Paris and studies politics and art history. Already in 1996 Yves Saint Laurent hires the young Slimane and soon he is promoted as chief designer for the men’s collection. With his distinctive cuts Slimane sets new standards for men’s fashion. Afterwards he starts at Dior Homme. People are saying that with his revolutionary slim-fitted suits the designer influenced Karl Lagerfeld to loose 40kg of weight – just in order to fit in into the slim collections of Slimane. In 2006, however, Slimane takes a step back from the world of fashion and dedicates himself to photography and arts. Since 2012 again the music-affine designer achieves to keep the revolutionary alive and at the same time to remain the high aspiration of French handicraft. As a friend of numerous popular musicians he is inspired mostly by rock music; as artist and photographer he values keeping up the close contact to the music scene. Consequently stars as Courtney Love and Marilyn Manson are the advertising faces for Saint Laurent Paris campaigns. The mission of Hedi Slimane is to maintain the original mind-set of the label Yves Saint Laurent and to take it to the future. The collections of Saint Laurent Paris capture former trends and interpret them in a new light. With sophisticated patterns, glitter and sequins and influenced by leathern and studded details of the Rock music scene Slimane achieves a rebellion mixture that stands for the youth and the wild. In contrast to these influences stand classic basics with clear, simple cuts and lines. Stars as Mick Jagger, David Bowie, Pete Doherty and Cara Delevingne are among the loyal customers of the extravagant but timeless label Saint Laurent Paris. In the beginning critics have a sceptical eye on the designer’s creations and fear that the new spirit is misunderstood; customers, however, love the new designs from the very first moment on and even critics now understand the label’s credo to break the norm with an avant-garde mind. Doing what is expected would clearly break the original spirit of the house Saint Laurent.